KAMPALA – The Auditor General Mr. John Muwanga has rejected fresh requests from Bank of Uganda to carry a fresh inquest on the UGX. 478 billion the central bank alleges to have injected in Crane Bank Ltd after the takeover turned controversial. 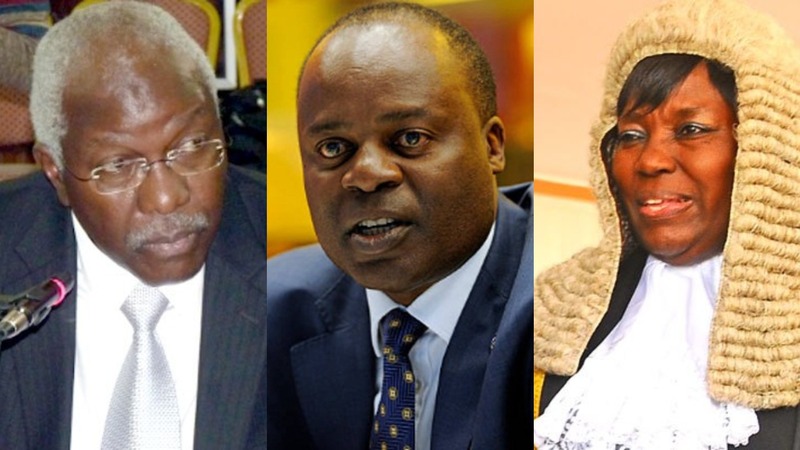 Mr Muwanga, in an April 4 letter to deputy governor Dr. Louis Kasekende flatly rejected a request by the latter, arguing that his report was already submitted to the Speaker of Parliament. Dr. Kasekende had in a March 11 letter asked the AG to undertake verification of documents that had not been availed during the audit, ordered by Parliament’s Committee on Commissions, Statutory Authorities and State Enterprises (COSASE). “Regrettably, I am unable to undertake the verification since the report has been issued to the Rt. Hon. Speaker of Parliament on February 18, 2018. Any additional verification on the already issued report can only be undertaken with the authority of parliament”. “We will keep the documents and wait for further communication from COSASE”. Mr. Muwanga’s letter is also copied to the Speaker, Rebecca Kadaga and the COSASE chairperson. 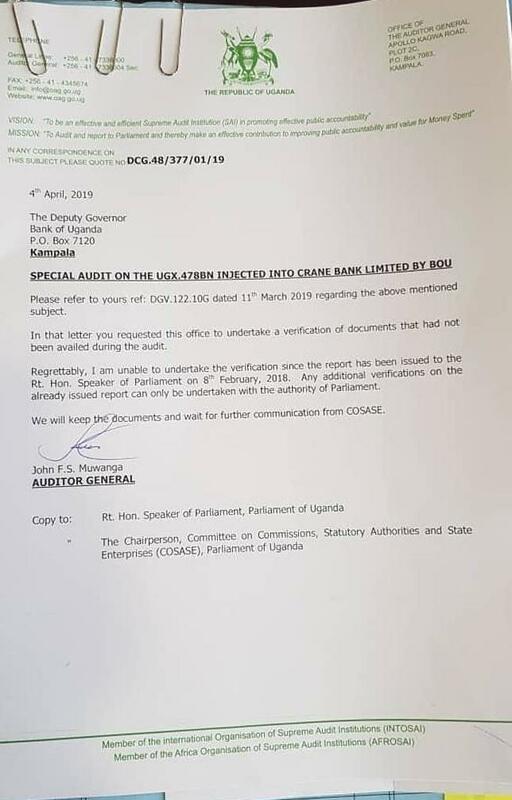 During the probe, Dr. Kasekende said when BoU put Crane Bank in receivership, the central bank acted as lender on one side and borrower on the other side, something the Committee Chairman Abdu Katuntu said created controversy in terms of accountability and transparency. The MPs argued that BoU officials should have used a private or official receiver to manage Crane Bank instead of doing it themselves. Interestingly BoU wants Crane Bank shareholders to refund the UGX. 478 billion yet they did not enter into any contract with CBL’s shareholders. Crane Bank shareholders led by city tycoon Sudhir Ruparelia told the probe that they would not pay that money since they don’t know where it came from, who received it and how it was used. BoU officials have no documentation about the use of the money. The MPs also hear that Crane Bank needed only UGX. 157 billion to stay afloat, but BoU spent the now controversial UGX. 478 billion on its liquidation. Dr. Kasekende told the probe that the money was spent as; telegraphic transfers (TTs) and LC payments, Real Time Gross Settlement (RTGS), clearing and cash requirement requests. An extra UGX. 12.2 billion was also spent on service providers including MMAKS Advocates who pocketed about UGX. 4.2 billion. The latest AG’s report on the now controversial UGX. 478 billion spent on Crane Bank liquidation by BoU officials, however, does not cover the UGX. 12 billion paid by BoU to service providers, reasoning that it was extensively dealt with by the MPs. The MP’s report made groundbreaking recommendations against Bank of Uganda and individuals named in what the MPs termed as “unlawful” closure of some commercial banks, The report also called for the compensation to directors of the “illegally’ closed banks, including tycoon Sudhir Rupareria’s Crane Bank Ltd and the National Bank of Commerce (NBC) owned by former Prime Minister Amama Mbabazi and friends.